The private chapel of St. Joan of Arc at Buena Vista (it now belongs to the Jesuits) was erected in the early 1900’s and was the site of the first regularly offered Masses in the Blue Ridge Summit (BRS) area. The Masses were offered by priests’ from St. Andrew’s in Waynesboro. In 1922 Masses were said by the Oblates of Mary Immaculate in the BRS Library, later called the Dunbrack Library (at the intersection of Monterey Lane and Charmian Road). In that same year the Red Man’s Lodge Hall (on the corner of Norwood and Summit Avenues) was purchased for $1,500. This building served as the parish church for forty-five years until 1964. St. Joan of Arc was the original name of the BRS parish. In 1920 the parishes in BRS and Fairfield were joined together for the first time. Father Matthew Scanlon, then the Pastor of St. Mary’s, was given charge of St. Joan of Arc. In 1922 Father Patrick Sullivan became the priest-in-charge of the Fairfield and BRS parishes. He changed the name of the BRS parish to St. Rita’s. He also bought the property where the present church stands for $8,000 and moved into the house on that property. In 1924 St. Mary’s got a priest of its own and in BRS Father Sullivan’s title was now Pastor thus making him the first pastor of St. Rita’s. In 1929 Father Herman V. Fischer was Pastor pro tem for six months. 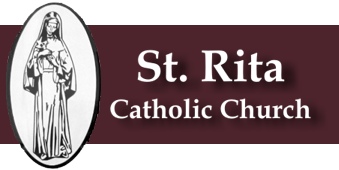 In December of that year Father James McGrath, the pastor of St. Mary’s, was given charge of St. Rita’s. Because of a lack of transportation there were no Masses at St. Rita’s that summer. In the summer of 1930 Father Philip J. Gergen began ten years of service as Pastor of St. Rita’s. These were depression years and the parish income was very meager. To help the parish survive Mr. and Mrs. David Fitz made a large garden where the present church stands and they preserved and shared the produce with Father Gergen. The handsome altar in the present church was fashioned by Father Gergen and Major Robert Barrick. Father William B. Cavanaugh was Pastor from 1940 to 1945. The parish became financially solvent during these years by means of a poultry farm that the pastor started. In 1942 the Shrine of the Blessed Mother that stands near the present church was built. The statue of Our Lady was a gift of Mrs. J. Boyd Davis. In 1945 St. Rita’s and St. Mary’s were joined together again by reason of one priest serving both parishes. The priests who have served in the double capacity since then have maintained their residence in Fairfield and traveled to BRS for their ministry there. This situation continues to the present day – over fifty years later. In 1945 and 1946 Father Joseph G. Gotwalt was the administrator of St. Rita’s and pastor of St. Mary’s. From 1946 to 1948 Father Cletus Hauck filled these offices as did Father Vincent Topper from 1948 to 1950. From 1950 to 1954 Father Francis J. McCullough served the parishes at Fairfield and BRS. A bus was purchased to provide transportation to St. Andrew’s School. In 1954 a bid of $8,200 was received for the renovation of the church building. That project was immediately abandoned. In 1954 Father John McAnulty began ten years of service to St. Rita’s. Now the idea of a new church was seriously considered. In 1962 Bishop Leech pledged a gift of $25,000 if the parish could raise $10,000. It did, an architect was hired and ground was broken in April 1964. During Father McAnulty’s tenure the bus was replaced twice, and in 1957 the children were transferred from St. Andrew’s to Mother Seton School in Emmitsburg, Maryland. That arrangement continues to this day. The construction of the church was completed and the first Mass in the new church was on November 29, 1964. The first organ for the new church was built by Richard Bloom. It was a Thomas Health kit organ which took several months to build. It was paid for by the Women’s Society. Father John Paukovits served from 1971 to 1973 and in 1973 Father Salvatore V. Zangari began six years as parish administrator. The building of parish camaraderie marked his work. He initiated the now traditional parish picnics. He also replaced the aged school bus. Father Ronald J. Moratelli administered the parish form 1979 to 1984. He continued the support of Catholic education, installed a new heating system in the church, and accomplished substantial changes in the appointments of the sanctuary. Father Herbert J. Shank was administrator for eight weeks in 1984. Father Joseph E. Fennessy became Pastor in 1984 and served for two years. He gave attention to the music for the liturgy and to the appointments of the sanctuary and church. His dedication to Catholic education was demonstrated when the parish school bus was replaced in 1984. Father Robert G. Kobularik came to St. Rita’s in 1986. In 1987 he supervised the design and construction of the parish social hall and the installation of air conditioning in the church, gifts to the parish from Leo and Leonora Rocca. Like his predecessors he continued the ministry of our Lord Jesus Christ, and vigorously supported the traditions of St. Rita’s Parish. In June of 1993, Father Kobularik was transferred and St. Mary’s and St. Rita’s were served by visiting priests for the summer months. On September 13, 1993 the Missionaries of the Sacred Hearts of Jesus and Mary assumed charge of both St. Mary’s and St. Rita’s. Father Michael A. Messaro, M.SS.CC. was named Pastor of both parishes and Father Robert T. McDade, M.SS.CC., Parochial Vicar. Father McDade’s primary responsibility was St. Rita’s Parish. For the first time in many years, St. Rita’s again had daily Mass. Also the Parish Pastoral Council and the Parish Finance Committee had been reestablished. The Missionaries of the Sacred Hearts of Jesus and Mary have continued to administer to the needs of St. Rita’s. Fr. Robert Malagesi, M.SS.CC. served as Parochial Vicar from June 2008 to May 2017. Fr. Peter DiTomasso, M.SS.CC was named Pastor of both parishes and Fr. Christopher Onyeneke, M.SS.CC was named Parochial Vicar beginning in May 2017.